Avira MailGate Suite checks the complete incoming and outgoing SMTP data traffic in real-time against viruses, spyware and other dangerous contents. Uncompromising protection: - Scanning of all incoming and outgoing or internally sent emails in real-time. - Recursive scanning of all email attachments, even of those in compressed form (archives). - Automatic placing of unknown archive formats and infected or suspicious files in quarantine. - Support of all conventional Linux distributions and MTAs such as QMail, Postfix, Exim and Sendmail. - Effective protection against spam attacks and previous warning before Outbreaks Fast updates: - Extremely small, bandwidth-saving updates of virus definitions through incremental VDF update. - Fast, seamless protection through updates without system interruption. Efficient configuration and administration: - Individual system adaptation to company specifications. - Central configuration, monitoring and control of the system. - Add-on email address filter. Comprehensive protocol, statistics and report functions. 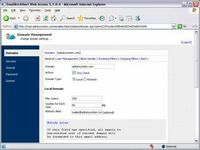 Advantages: - Whitelisting/Blacklisting Feature; - Block Spam at the server; - Support for MTA Plug-Ins Courier, Communigate Pro and Qmail - Integration of eleven espurgate 2.0, which offers improved spam detection capabilities, particularly with image-based spam; - Detailed logging (Helps administrators to track spam); - Template keyword for VDF date (Helps administrators to easily identify if the email was scanned with a recent VDF version). Limitations: The Installation Kit comes fully featured but the update service is disabled. To enable the update service you may purchase the appropriate commercial license from www.avira.com.